By Hadi Bazzi, D.O., Dennis P. Vollman, D.O. A 56-year-old woman presented for staging after a suspicious lung nodule was discovered. Anterior whole-body planar image from a Tc-99m methyl diphosphonate (MDP) bone scan (A) demonstrates heterogenous increased linear cortical uptake in the bilateral lower extremities having a “double stripe” or “tram-track” appearance. Fused F-18 fluorodeoxyglucose (FDG) PET/CT (B) demonstrates a hypermetabolic spiculated pulmonary nodule in the posterior left lower lobe. Tissue sampling of the nodule revealed primary bronchogenic carcinoma. Nuclear medicine bone scans are common in clinical imaging and are highly sensitive at detecting osseous metastases, but are not specific. 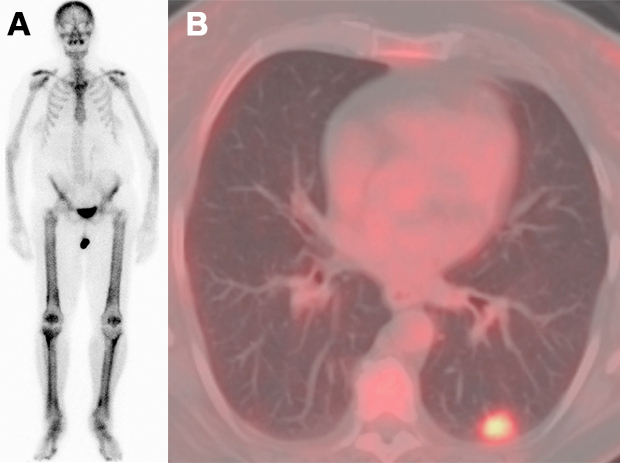 It is important for the interpreting physician to be aware of HOA and its imaging appearance on bone scintigraphy to avoid the misdiagnosis of osseous metastatic disease. Mettler FA and Guiberteau MJ. Skeletal system. In: Essentials of Nuclear Medicine Imaging, 6th ed. Philadelphia, PA: Elsevier Saunders; 2012:300-301. Yap FY, Skalski MR, Patel DB, et al. Hypertrophic osteoarthropathy: clinical and imaging features. Radiographics 2017;37(1):157-195. Bazzi H, Vollman DP. JAOCR at the Viewbox: Hypertrophic Osteoarthropathy. J Am Osteopath Coll Radiol. 2018;7(1):32. Hadi Bazzi, D.O., Dennis P. Vollman, D.O. Dr. Bazzi and Dr. Vollman work with the Department of Radiology, Garden City Hospital, Garden City, MI.